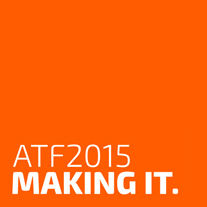 Registration for the 2015 Australian Theatre Forum (ATF) has now sold out. The Australian Theatre Forum is an industry event for professional theatre practitioners, producers and commentators that welcomes participation from all parts of the industry—independents* and project based collectives, small to medium and major companies, producing venues and festivals. Please note that large and medium organisations can register a maximum of three (3) delegates for ATF. Small and small-to-medium organisations can send two (2) delegates. Be sure to book for the appropriate turnover category. *The Expression of Interest (EOI) process for Independent Delegates closed on 18 August 2014. See the Independent EOI page for details about that process. We will offer full refunds, less a $50 admin fee, for cancellations advised up to four weeks prior to ATF (Tuesday 23 December). For cancellations after that date, we will refund 50% of registration fees paid. After COB Friday 16 January, no refunds will be offered.